Primarily known as a sculptor, Harry Bertoia came to the United States in 1930. From 1939–43, he studied and taught metalwork and jewelry at the Cranbrook Academy of Art in Michigan, where he met Cranbrook alumni, including Charles and Ray Eames and Florence Knoll (née Schust). 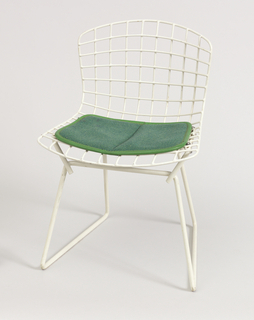 By 1950, Bertoia was based in California, where he created art and sometimes worked with Charles Eames. 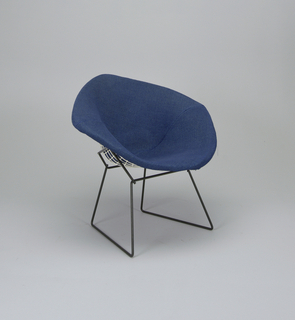 In 1950, Florence and Hans Knoll, interested in developing new furniture lines, invited Bertoia to move east and work for Knoll Associates with an unconventional arrangement: they would provide a salary and a studio near the Knoll factory in Pennsylvania, but would not make specific demands on Bertoia’s time or creativity.... more. 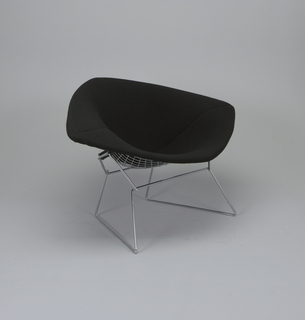 We have 3 objects that Harry Bertoia has been involved with.